Welcome to the land of champagne wishes and caviar dreams! Ice-Cream Lab recently opened its doors just down the street from famed Sprinkles Cupcakes on Little (South) Santa Monica Boulevard in the 90210. Its shtick? Creating freshly-made organic ice cream to order using futuristic liquid nitrogen machines to freeze your treat right in front of you. We headed down to Beverly Hills for the afternoon to walk around and check out the newest addition to the boulevard. I have to say that overall, the experience was just okay. I very much enjoyed their approach in using fresh ingredients, and the liquid nitrogen gimmick was cool…for about 5 minutes. While they all sounded yummy, I was not happy that essentially you’re limited to choosing from only 6 pre-designed lab creations. It seems in this day and age, the way to go is by offering customization in my humble opinion – especially, when it comes to ice cream. Didn’t anyone get the memo? At $5.00 for a small (5 ounce) and $7.00 for a large (7 ounce) cup of ice cream, it was a pricey treat – but this wasn’t a huge surprise. I went with a small Blue Velvet ice cream: blue velvet cupcake with cream cheese frosting (pictured above). It was a delicious way to spend 20 minutes on a Saturday afternoon. 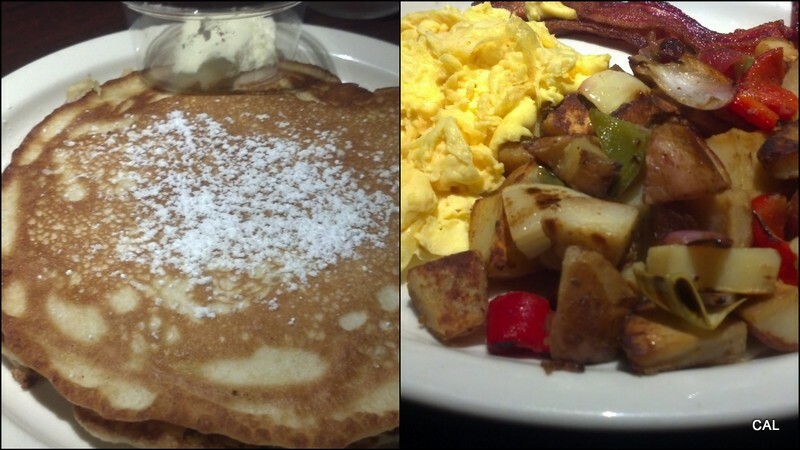 Unfortunately, beyond the made to order gimmick, I wasn’t terribly impressed and didn’t have that “I’ll be back” feeling. Ice-Cream Lab is going to have to beef up their menu options and/or offer customization for its patrons. I’m not saying it was “never again” awful, but with Sprinkles just down the street, you’ll likely find me there. I not 100% sure Ice-Cream Lab has staying power. PROS: Awesome location, hip decor, organic and fresh ingredients, serves Intelligentsia coffee. CONS: Non-customization available, pricey (not surprising), not a lot of seating, and a very limited menu. Week 2 into the Fall season and the L.A. heat wave continues. A few days ago, a great idea came upon my boyfriend and I as we were running some errands in West Hollywood that momentarily (and I mean momentarily!) 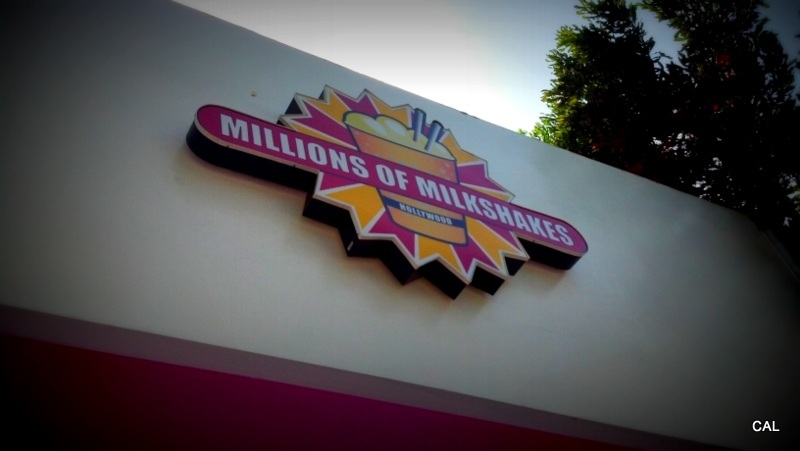 made me grateful for the heat: a more than justifiable pit stop to Millions of Milkshakes. 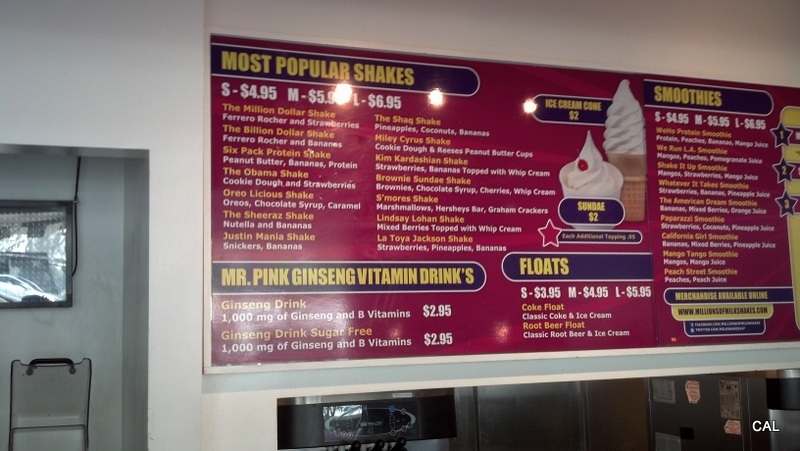 Of course, I’ve been to Millions of Milkshakes before, but this was my first time visiting the original location that opened in 2008. Aside from the loud music (must every L.A. establishment give off the “we’re so hip party vibe” by making you scream your order at the cashier? ), the air-conditioning was welcomed and the menu continues to be fun. You can get creative however you choose by customizing a creamy treat to your exact liking, ordering from their popular shakes selection; or if you really want to be creepy and channel your favorite celeb in an intimate way, you can order from the celebrities menu where an A-lister (but most times a total D-lister) has created and endorses their own personal concoction. P.S. I know we are all human and have worth, but why is Ocotomom on this list? I went with “The Million Dollar Shake” from the most popular shakes menu, made with Ferrero Rocher chocolates and fresh strawberries. It was too hot to get cute, I’m still reeling from my obsession with mixing chocolates and strawberries together in anything, and I thought the idea of saying “I’ll take a Miley Cyrus to-go” was silly. 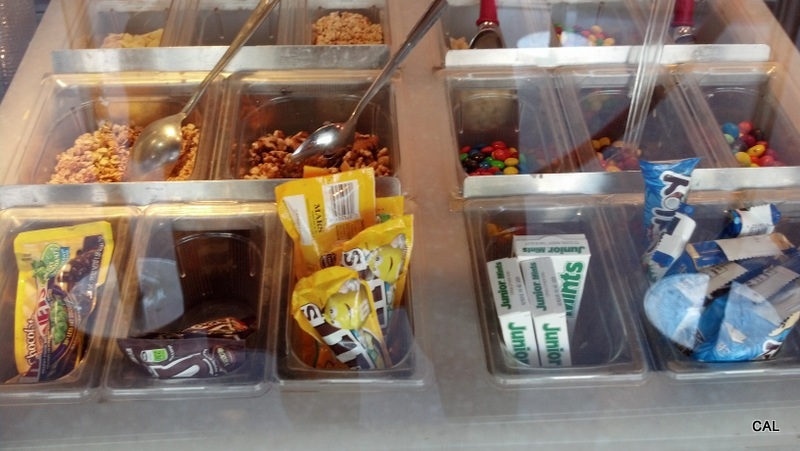 My guy didn’t follow the leader at all, and went customized – vanilla ice cream with peanut butter M&M’s. Worth. The. Hype. 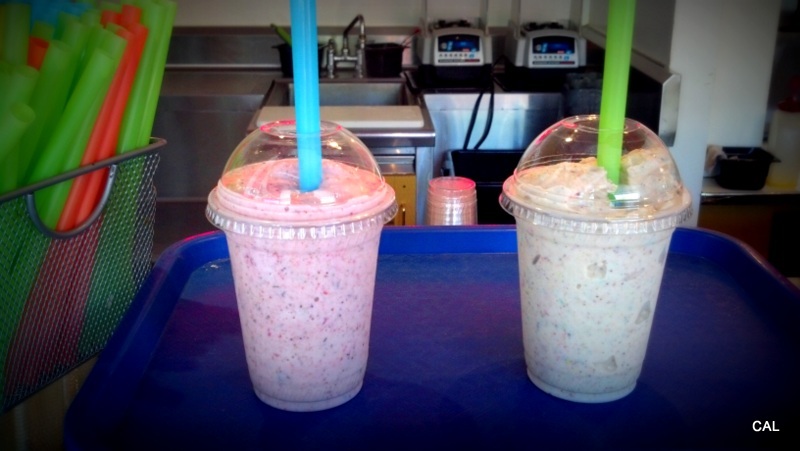 Now I understand why milkshakes bring all the boys to the yard! Posted in Breakfast, Documentary, Explore, Film, Food, Fun	by C.
Just past the congestion of the infamous meeting of Sepulveda and Santa Monica Boulevards, under the ramp of the 405 freeway, and immediately to your left – rests one of my favorite L.A. movie theaters, The Nuart. 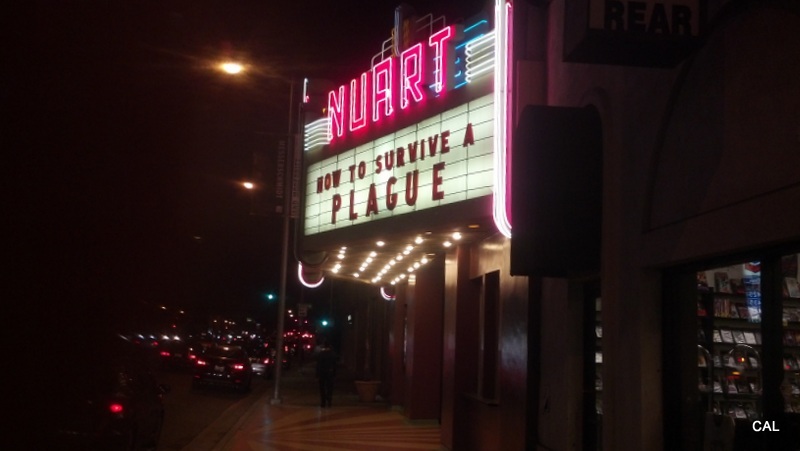 Though it’s apart of the Landmark family, The Nuart keeps that off-beat theater vibe well in tact from the marquee down to the strictly independent and documentary focused programming you’ll find here. What a powerful and thought-provoking way to start the week. The documentary chronicles the New York activist scene fighting the lack of attention from the US government, hospitals, and drug companies to the raging AIDS epidemic stealing the lives of millions in the gay community beginning in the early 1980’s and until a treatment was discovered to survive. Most impressive about the film is that it’s mostly compiled of and told through the use of archival footage of old Act Up and TAG activist meetings, media coverage of protests/demonstrations across the country, and personal home video. I left the theater feeling like I had a solid understanding of the struggle it took to get medication, education, and compassion towards what was a modern American plague only 30 short years ago. I couldn’t help but think about how a similar uprising could benefit the millions of people in Africa as I type this sentence battling the same disease, among arguably even worse circumstances. You’ll be surprised what you can do when you don’t give up.